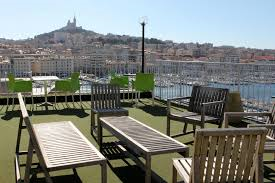 Marseille is a bit of a hike for lots of us who don’t live in or near it, and there’s a lot to get around, so we’re including ideas for places to stay over, so you can make a few days of it, at a more relaxed pace, should you wish. There are also lots of events and street theatre in the summer evenings. 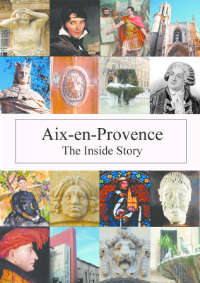 Our recommendations are largely based around the ever-attractive Vieux Port area, where most of the action is. We’ve tried to tread the path of making it reasonably comprehensive without being too dull in detail, and being factual and useful, but including a few personal preferences and comments. These are largely concentrated on the Quai du Port side, as it is closer to the action, and has got that glorious view of Notre Dame de la Garde over the port. But I’ve included a couple of further-afield places, for their prices, mainly. (from €265 to the Presidential Suite at €2,182!) Up until recently the Sofitel was the best hotel on the port. 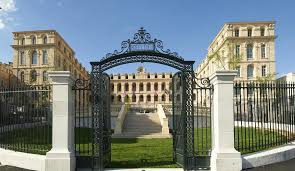 But The Intercontinental Group has just opened up in the huge and beautiful Hôtel de Dieu, overlooking the Vieux Port. It’s a magical setting, and if you can’t afford to stay there, a drink on the terrace, watching the sunset, could be a good substitute! 189, Quai du Port (from €180). A very smart hotel, charming staff, good sized rooms, mostly with the best balconies on the VP, looking up to Notre Dame de la Garde. 2 rue Bonneterie (from €90). 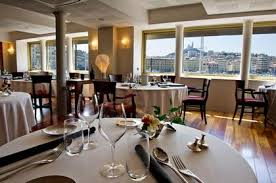 Most rooms actually don’t have a view, facing east – but this is a great value port hotel, with very good staff, stuck onto the back of the higher-priced Bellevue. The rooms are small but perfectly formed, but you could splash out on the quirky honeymoon suite on the top floor, which has almost the best view over the harbour. We once watched the 14th July firework display from here, and it was really unforgettable. 35 Quai des Belges (from €79) a functional hotel, newly renovated, clean and attractive. Faces out to sea. 12 Bd Salvator, (from €99), about 12 mins walk from the VP, is a concept hotel, modern-style with chic bedrooms, stylish bars – looks great fun with all sorts of witty art and bright furniture..
64 rue de la Loubière, near Cours Julien (€49-79), about 10 mins from VP. This new 6 storey, 127 room hotel won 13th place last year in Conde Nast’s 62 Best　New Hotels in the word (they called it a “hip haven”). Designed by Philippe Starck the prolifically famous French designer who has designed the interior of the President’s private apartments at the Elysée, i-pod speakers, toothbrushes, windmills and furniture. The bedrooms are brightly clean and functional, and the common parts utterly funky. Lots of advantages – free (new) films and Imac multimedia in your room, a free carpark with 54 places, a restaurant, reserved places on a nearby beach, babysitting etc. 10 Bd Charles Nedelec (from €72 for a studio for 2, €94 for an apt for 4 adults). This is a recently built (2012) block of flats, rentable daily. Could be great for families – and, as it has kitchens, with washing machines etc., so good for longer stays, too. Smart and modern. Air-conditioned. Nearby parking can be booked for €10 per day, but you’re only 5 mins walk from the Gare St Charles, 12 mins from the VP, and 1 km from the cathedral. A good alternative, and great value. Although the Vieux Port is lined with restaurants, many are real rip-off tourist traps, so we’ve picked out a selection of tried and tested favourites…. 2 Quai du Port. This upstairs, chic, modern-style resto has just (automatically) lost its Michelin star, since Lionel Lévy, the talented owner chef handed over the reins, at the end of 2012 to his sous chef (who is married to the sommelier). But it is being run in exactly the same way – and some of the pricing has come down, as a result. 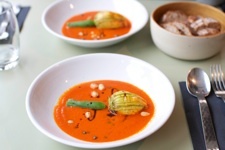 You can now get a three course lunch there for 29 euros – limited choice, but as delicately spiced and flavoured, as prettily presented, as temptingly inventive as before. Fabulous views over the harbour to ‘La Bonne Mère’. 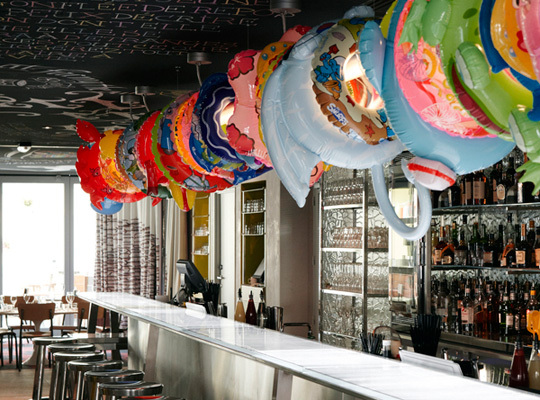 24 Quai du Port: freshest seafood and shellfish. 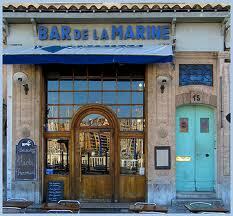 They also offer «　le vrai bouillabaisse　» – but really it’s for the shellfish you should go here if you’re a fan. For one thing, they serve all the surrounding restaurants with their shellfish ‘take-away’ style, so they must be the best! 4 rue de Lacydon, just off the busy Vieux Port, perched over the Parking Hôtel de Ville. Lunchtime simple blackboard with 2 choices for each course. Imaginative and stylish. Full menu €25 – 21 for 2 courses. More elaborate and expensive in the evening. Pretty terrace surrounded with olive trees in pots. Small, must book. 23 rue Caisseraie, 3 blocks back from the Hotel de Ville. 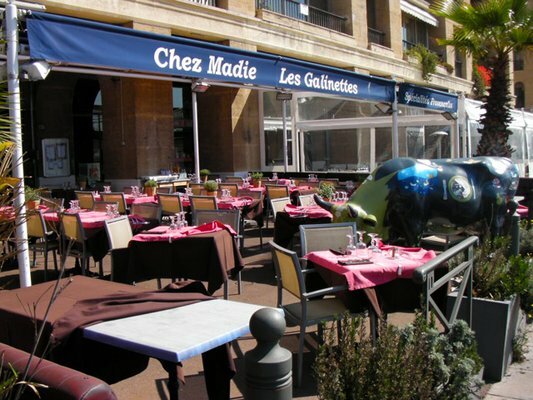 The weird thing about Marseille is the lack of REAL fish restaurants. This recent addition is spawned from its famous eponymous parent halfway up the Canebière, which is really a poissonnerie + a few tables attached. This, too, is a small place, without huge choice, but there is a great little terrace and the fish are as fresh as chips. (Actually they do a Marseille version of Fish & Chips: whiting & panisses (chickpea chips). Superfresh shellfish. 15 Quai Rive Neuve is an old favourite, a characterful bar facing onto the Ferryboat, opposite the Hôtel de Ville. It first came to fame through the films of Marcel Pagnol, and prints of ‘Fanny’, ‘Marius’ and that infamous game of cards add to its attractive 1930’s décor. It’s very Marseillais – a haunt of locals more than tourists; its young staff are friendly and as generous and robust as the cooking. Huge salads and brasserie-type food plus couple of dishes of the day are very reasonably priced, kept low by the the very basic wine list. Bustling, congenial, it can be a bit squashed inside but in summer there’s a decent-sized outside terrace by the port. (that’s its name!) In the corner of this attractive pedestrian square one block back from the port, this place does good modern, affordable Provençal food, but is most famous for its huge wine collection (all 2,000 of them!) – available by bottle and glass – and it is unpretentious in style, despite that! Menus from €19.50 – 49. 39 rue de la Paix Marcel Paul; Although this is 4 blocks back from the port, it is fast becoming Marseille’s hottest restaurant. Book as far ahead as possible – really hard to get a table. Recently gained its first Michelin star. Again not a big choice, but fine, delicate, inventive, fabulous food. Try their home-made ice-creams. 2 Quai du Port. Marseille’s most popular meeting place. 25 Quai des Belges/de Fraternité. The sporting bar – catch all the football matches. Here is a distillation of the key NEW cultural hotspots. The architecture outside, in most cases, is every bit as interesting as the art within – extravagant modernity – make your own mind up if it’s coolly classy or just plain flashy! Long awaited, it opened early June 2013 with great brouhaha. This is a hugely important exhibition space containing the Musée de Civilisations de l’Europe et de la Méditerranée (hence MuCEM) gathered from museums throughout France, tracing the history and scope of the many and varied empires and cultures that have dominated this sea for millennia. Designed (for €190m) by architect Rudy Riciotti, it is an extraordinary square building of concrete floors and pillars held together by glass and black twisted metal, throwing shadows over the interior, rather like a purdah wall of a harem. Officially MuCEM is France’s first stand-alone national museum outside Paris, and it’s well worth a visit. sharing the old J4 jetty with MuCEM, and its carpark, looks, appropriately, out to the sea, over a bassin of water that seems to bring it lapping to its door. No art exhibitions here, the visit here is is all about its architecture. It’s an amazing building, designed by Italian architect, Stefano Boeri, to be a meeting place, conference centre,　‘a place for encounters, ideas and exchanges’　– somewhere citizens and experts can debate the future of the Mediterranean and its countries. In fact, when visiting it, we were told “it is not a building, it is a dialogue“. Well, make up your minds when you see it, but for €70m, I wonder if it should have a more ‘concrete mission’ for its existence. Call me a cynic. But it’s definitely worth popping inside its 100,000m² to have a look. This is what The Guardian said about it: “The first thing you see as you turn the corner of the bay is its sheer white façade butting into the dock like the rump of a cruise liner, complete with tinted oblong windows. From the other side, the building looks like a supersized diving board, with one vast exhibition hall jutting out towards the sea in a 40m long cantilever, suspended above a pool of water”. There are two parts to this very relaxed art gallery: the permanent expo, related to how they converted Marseille’s old Station Sanitaire into this modern, airy building, and the art itself, which, as the name suggests, concentrates on Provençal subjects and painters/sculptors.There are two new expos here (until Oct 6th), which couldn’t be more different. 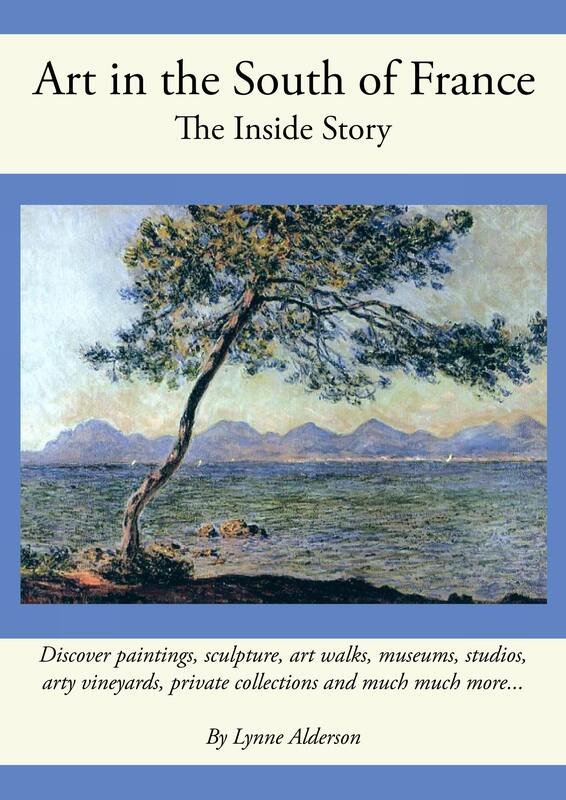 Firstly, ‘Cassis Port de la Peinture au tournant de la Modernité 1845-1945’ is full, as you’d expect of pictures of the pretty port and its pointus. Bright colour and vibrant light emanate from every wall as you pass through. In contrast, upstairs is the second, more modern exhibition ‘Bernar Venet. Carpiagne: The Origin’ based on the 1960’s when the artist lived down here. Black is the new black, here, with a pile of coal as the centrepiece and the other, surrounding pieces made from cardboard scraps and tar-painting. He also includes sculptures, in the adjoining gallery. Interesting. Right at the top is the panoramic café-restaurant – appropriately very Mediterranean in style, with a slight Spanish penchant. The full name of this museum, designed by Japanese architect Kengo Kuma (at €22m) is the Fonds Régional de l’Art Contemporain (hence FRAC) and is set further back from the sea, in the Joliette district – 20 bd de Dunkerque. It is a museum with no internal walls, a “space” for young artists to show their work, particularly, in an urban environment. Over 7 floors it contains exhibition space, a café, projection and meeting rooms, and a floor of accommodation for artists in residence, as well as two “terrasses urbaines“. There are several expos of contemporary art on at any one time, in this shimmering tower of angled glass panels. This structure, (pl Henri-Dunant, 5 Avenues, go to the top of the Canebière and carry on walking) was originally constructed in 1869 as a celebration of the Canal de Provence, bringing Marseille’s water to its citizens from the Durance. The elaborate water feature in the centre is framed by two major museums: the Natural History Museum, and the Musée des Beaux Arts. Having been closed for renovation for years, the latter monumental building is home to the the city’s permanent collection of paintings. Where once there used to be a real zoo, as part of the Natural History Museum there are now bright plastic “animals”, created by funky artists. Good place to picnic, and take the children. Quai Belges, at the end of Le Vieux Port – conceived by Norman Foster as part of his ongoing regeneration plan, it is a €36m huge rectangular open structure supended in mid-air, made of polished steel, the ceiling of which not only shades you from the sun, but is a massive mirror whereby you can look up, walking underneath, to see the world upside down – significant artistic statement…. (41 rue Robin, near Gare St Charles). Based in and around an old tobacco factory this 4 hectare site is basically punk/street art, graffiti, street theatre: general “happening stuff”. Accompanied by various hip-hop type musical events, planned or spontaneous: this is where youth-culture hangs out. 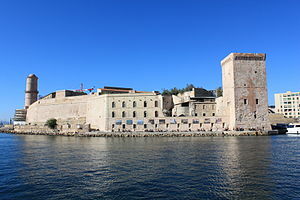 The islands, including Château d’If, well preserved prison of Count of Monte Cristo. Regular boats from the Quai Belges, Vieux Port. If you need to know the sea-temperature before setting off to the beach, there’s a new app which will help. ‘Marseille Infos Plages’ gives air temperature, sea temperature and also details on whether your chosen beach is in fact open. 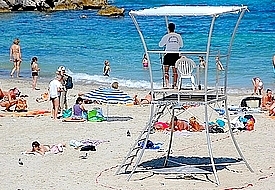 (The river Huveaune which joins the Med near the Prado beaches sometimes carries contamination which leads to beach closures). There are now guided tours of e city by e-bike. You can choose between a 4hr (23km) tour of the sea-front and Notre Dame de la Garde from the Vieux Port, a shorter version of 3hrs (15km) at 39€ or a day in the calanques 6-7hrs (35km) at 79€. Contact the company on http://www.ebiketours.fr. They also do private tours for groups, or sessions for team-building. You have to be over 5 feet tall………..children go in one of those trailers at the back. If you come in from the Tunnel off the A50 (ie coming from Aubagne direction) it’s two-way only as far as the Parking Estienne d’Orves. But don’t forget there’s the (free) ferryboat linking both sides of the port. So you could park here, and get back easily. But if you carry on driving round, it gets slow, with jams, and though parking is convenient in the Hôtel de Ville carpark, it’s also quite a hassle getting back out. If you decide to park at Estienne d’Orves, if the ferryboat’s not working (all too frequently!) there is also an electric bus service which runs around the VP, then turns round, and comes back – and costs 50 centimes. Runs every few minutes and seems to be always empty! Loop 2. Notre Dame de la Garde. Loop 3. Les Iles de Frioul. Take a boat across to the islands just across from the Vieux Port and the petit-train can be found beside the port. It will take you on a half-hour journey around the island. Great views of Marseille. Cafes in the little port. (summer only). 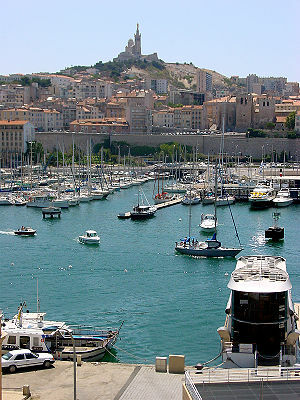 Château d’If – and the Iles de Frioul, where the restaurants jostle along the sea to offer you their seafood. Boats leave virtually every half-hour, except for the lunchtime break. €10 aller-retour. Pointe-Rouge – a popular beach spot and pleasure port to the south side of Marseille, not far from Parc Borelli. Brightly coloured Batobus navettes leave hourly, €5; the journey takes about 40 minutes. L’Estaque – Batobus again provide a regular cheap service, past the “new” Marseille seafront with all the museums etc. to this interesting, much-painted village 9ks north of Marseille.